In two 8x8 pans fill one with red gelatin mix and the other with the blue gelatin mix. Add 2 1/2 cups of water to each mix and mix till gelatin is completely dissolved. Then place in the fridge for 2 hours. Once both gelatin colors are made, remove from fridge and remove from pans. Cut each slab of gelatin into 1-inch squares. Then mix the two squares together. In a large 9x13 inch glass dish, add blue and red gelatin squares and place back in the fridge while you work on the white portion of the gelatin. Add packet of unflavored gelatin and coconut gelatin mix to a large bowl, then pour 1 cup of boiling hot water to the bowl and mix till completely dissolved. Once gelatins are dissolved, add condensed milk and milk to the dissolved gelatin. Mix until completely incorporated and the mixture is a creamy white colored. Pour white gelatin mixture over the red and blue colored gelatin squares and place in the fridge overnight. Using a butter knife, run the knife along the edges of the 9x13 inch pan and carefully remove the gelatin slab from the pan. Then cut into squares. You can prepare the red and blue gelatin up to a week ahead of time. 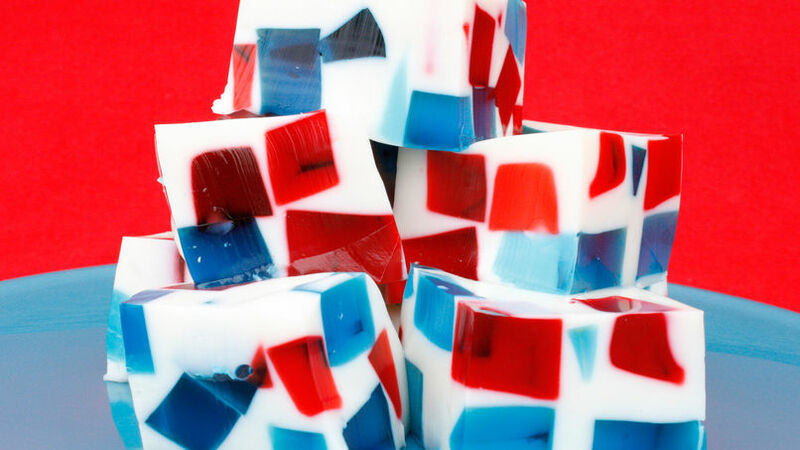 Make sure the white gelatin mixture is at room temperature before pouring over the red and blue squares. My family loves my festive 4th of July stained-glass gelatin squares, and there is always someone who wants a piece of wiggly, jiggly gelatin amongst them. The way I see it, this dessert adds a festive flair to any 4th of July holiday table. Each square is like a mini mosaic art piece, almost too pretty to eat, until you taste it. Then you’re no longer obsessed with looking over the beauty of the colors but now smitten beyond with the fanciful kaleidoscope of flavors these gelatin squares hold. Sweet cherry and blue raspberry gelatin nestled between coconut-flavored gelatin makes for a sweet surprise you won’t forget too soon. Kids can hold the gelatin squares in their hands or eat them off a plate with a fork. How you enjoy the square is entirely up to you, but one thing is certain… They will make this 4th of July spectacularly delicious.